Daily self-care is an essential part of life. So creating an atmosphere that is conducive to wellness, especially when traveling, is critical. To help me feel cozy and at home wherever I may be whether it’s in a hotel room or Airbnb rental I like to feel the zen of a high-vibe environment. Here are my must-haves that help me de-stress, reduce jet lag and feel blissful in my space wherever I go. I did a whole video + blog about the types of natural elements that I carry with me that help me to stay on track with my meditation and allow me to create sacred space wherever I go. Things sometimes (often) happen that are outside of your control when you’re galavanting these global streets. It helps to keep a positive go-with-the-flow attitude. Really any inspirational reading or even writing in your journal will do. It's one of the things that I recommend on my Spring Detox checklist in order to flush stress or anxiety from your spirit. You can grab all of my suggestions for free when you subscribe to my blog and access the Creative Tribe Resource Library. My daily tea ritual is one that helps me get grounded and start my day with my favorite simple pleasure. I kicked my coffee habit long ago once I realized that the right type of teas can get the job done and give me the boost I need without the crash later in the day. My number one pick is yerba mate, by far. Its benefits include: High bio-caffeine (natural), antioxidants, improves digestion, and is loaded with vitamins and minerals. Second to that, a strong flavored black tea is another trusted favorite. Trader Joes revolutionized the game for me with their little packets of coconut oil. They travel extremely well. I just pop open a box and stash 4-5 of them in a sandwich baggie and go. One packet is plenty of moisturizer for my entire body for one day or more. One of my favorite go-to supplements to keep me energized is the amino acid, L-Tyrosine. This is one heavy hitter in my arsenal. Just 500 milligrams has the ability to not only boost your energy level, but your mood and brain function. I spend a lot of time writing and creating at my computer, so L-Tyrosine is a necessity to keep me going. I am a snack-o-holic with an affinity for crunchy tidbits mid-flight. And… we all know the snack situation at airports and in hotels is typically bleak or waaay overpriced. Therefore, the smart thing to do is to byob-- bring your own bites. That’s why I ALWAYS have snacks on deck. I’ll usually go with apple or sweet plantain chips, trail mix, and the irresistible king of snacks-- popcorn. All are perfect crunch companions. Nothing says relax and make yourself at home like fresh sheets. A mix of your fave essential oil-- mines is lavender and rose, a dash of vodka (or rubbing alcohol) and distilled water is all you need to spritz a little magic and cozy up your temporary abode. Soy wax candles are the best clean burning candles. I usually travel with the ones that come in a jar. They’re tiny, portable, and the lid helps keep dust and other random stuff out of your candle mid-flight, and keep their scent in. 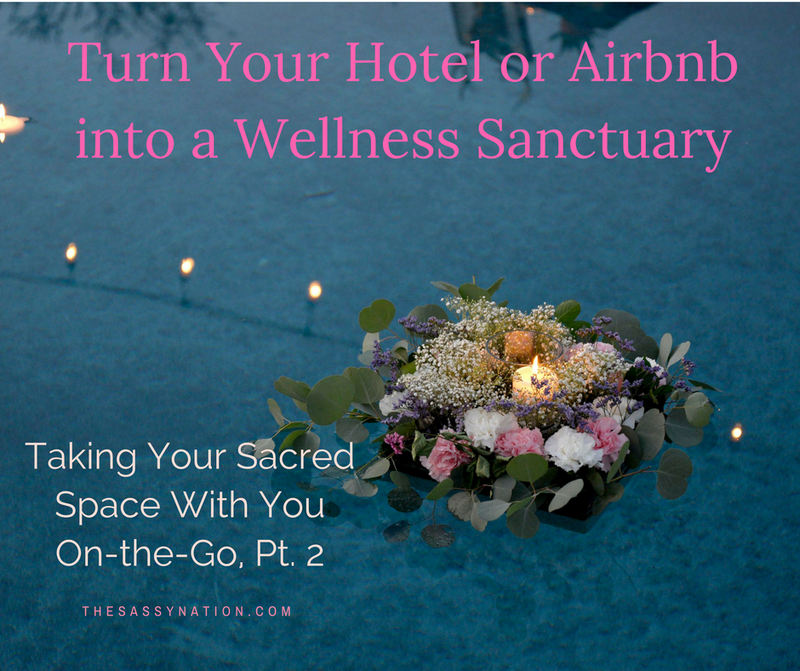 What do you pack to take your zen with you and create a wellness sanctuary where ever you go? Leave me a comment below or on social and let’s chat there. Happy travels!!! We're getting down down to the wire and the timer is running out on our Early Rising registration rate to attend Luna Rising. For the next few days, you can still come to Luna Rising for $500 off the regular price. ...And to help you get started mastering your mind and seeing how magical you are and your life can be, we’re offering you FOUR bonus gifts when you register! Want to know how to energetically cleanse your body to let go of things that no longer serve you? There's so many different methods you can use but, if you’re looking for something simple and easy, here is one ritual you can do that is especially powerful around the new moon, or any other time you feel you have energy you’d like to release. The upcoming spring solstice, for example, is the perfect time for rinsing away the stagnant and ushering in the new. Typically, the new moon is a time to plant seeds that will cultivate during the rest of the moon cycle. However, a seed can only grow in fertile ground. So, sometimes it’s necessary to clear and prep the field first. Doing a ritual is one way we bring reverence for all that is sacred into our modern world. Women of the world are coming back to knowing and tapping into our Divine Feminine power. So, now is the perfect time for us to get in sync with the rhythm of the earth to align with our inner individual and collective strength. Time to get in formation, ladies! Let's use this new moon in Aries to set the stage for our blossoming this season. Step 8: As you pour, ask for guidance to let go of the things that you don’t need anymore, give thanks for what you are releasing and let go with forgiveness, kindness and love. That's it! You're ready to set some new intentions and sow seeds of greatness for the upcoming month ahead. Have you been looking for a sister tribe that will hold space for you and your dreams? My Sisters in Spirit teaches women like you to raise their vibration using holistic wellness practices—including clean eating, yoga and meditation. We share principles that will help you become grounded in your beliefs about your inner feminine power and capabilities so that you can manifest the life of your dreams. Luna Rising is firmly rooted in holistic wellness, ceremonial reverence and sisterhood-- the pillars that modern woman are coming to realize are needed to lead a healed and fulfilled life. Thinking of traveling solo to Luna Rising? Here's some encouragement for you to step out on your own and soar!